The lovely Raquel, the concierge at the Trump SoHo, recommended BareBurger as one of her favorites. It was a snap to get a table as the restaurant opened, and I had the good fortune of getting some of Misha's time. Misha was a managing partner at Bare Burger and was highly involved in the operation the Laguardia Place location. This was the second location of six with another scheduled to open in mid-November and seven more in the works. BareBurger was expanding rapidly, and I hoped that they were doing it with integrity. BareBurger took sustainable and organic to a new level. The wood for the tables was harvested from storm damaged trees. The walls were bamboo. The light fixtures were recycled containers. The to-go containers were made of biodegradable corn. The ketchup and mustard were organic. All of the meats were sourced cruelty free, free range, and organic. The meat choices were broad: bison, ostrich, elk, beef, chicken, turkey, and wild boar was on its way the following month. All of the vegetables were certified organic, as well. It was with a little trepidation that I ordered an Original BareBurger, and I requested Med-Rare after determining that Chuck was a minority constituent of the beef blend. My concern was that BareBurger, in their relentless pursuit of delivering a certain type of product might have lost sight of the goal of delivering a delicious burger. My concerns proved to be unfounded. 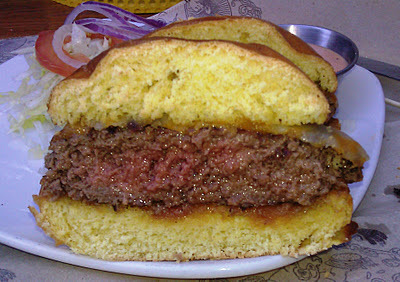 The Beef: The 6-ounce patties were a Sirloin-heavy blend of Sirloin and Chuck. The beef was wet-aged and sourced from Blackwing. The fat content was a scant 10%, and that fat was not missed. The burger was wonderfully juicy. The flavors were strong steak and beef with a mellow note of aging. The bite was juicy and tender. The Med-Rare cooking temp let the minerals shine through from the Sirloin.This was highly satisfying beef. I had difficulty putting this burger down. The Seasoning: A great deal of care went into the preparation of the proprietary seasoning blend, and this savory/tangy mixture was liberally applied to the exterior of the patty as it cooked. The seasoning lent a savory and mild barbecue flavor to the dish. The seasoning was unique, interesting, and it worked perfectly with the flavorful beef. The Sear: The sear at BareBurger was created using a properly hot flat top. The sear was crisp and dark. It enhanced the already rich and sturdy flavors of the meat and seasoning. The texture was also most welcome. The Preparation: The beef was ground to medium and gently formed into the thick, 6-ounce patties no less than three times per day. The point of this was not to let the proteins knit together to create chewiness. This attention to detail resulted in a very tender bite of perfectly cooked chopped steak. My Med-Rare request was perfectly executed. The Cheese: The blend of organic Colby and Jack Cheddars was flavorful and sharp. The cheese lent just enough oil to the dish to round out the mouth feel. The Bun: I was briefly taken aback to learn that the Brioche buns at BareBurger were sourced from Philadelphia. That seemed like a long way to go for buns when New York had so many good bakeries. The moment that I bit into the moist, firm, eggy, sweet, and toothsome bun, I completely understood why they selected that bun purveyor. The bun was perfect for the burger. It brilliantly absorbed the juices while maintaining its consistency and contributing its own flavors to the dish. 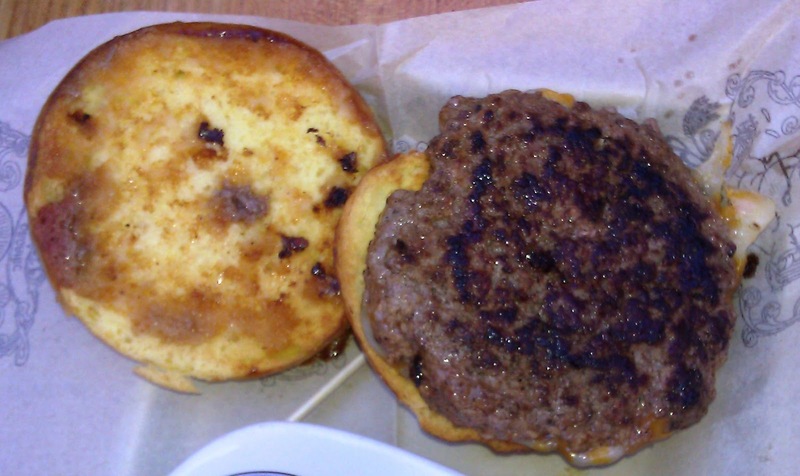 The bun was lightly toasted, and in the case of this burger, the crunch was not missed. The Meat To Bun Ratio: This was perfect. Every bite was ideal. The Fries: Wow! The organic, peel-on, hand-cut fries were par-cooked in soy oil and finished in peanut oil. They were crisp on the outside and creamy on the inside. They were golden brown and perfectly seasoned. I had difficulty not filling up on the fries at BareBurger. The Sauces: The sauces were best described as smart. I was especially fond of the house-made barbecue sauce. This sauce employed some Indian themes as well as traditional flavors. Since it was a proprietary blend I have chosen not to share the breakdown of the ingredients, which I managed to puzzle out. The chipotle sauce was splendid, as well. The Toppings: The lettuce and tomato were both surprisingly fresh and flavorful for the first week of November. The Shakes: I sampled a chocolate shake at BareBurger, and it was marvelous. The ice cream came from Blue Marble Ice Cream in Brooklyn. This purveyor shared the same passion and commitment to sustained organic food. Beyond that, the ice cream was fantastic. There was an abundance of crumbly, dark chocolate shavings that lent a wonderful texture to the creamy dessert. I loved the shake. The Value: A cheeseburger at BareBurger went for $8.95, and that was money well spent. The value at BareBurger was strong. I walked into BareBurger a hungry skeptic, and I walked out of BareBurger a sated fan. I strongly urge you to try BareBurger. They prepare thoughtful, skillful, and flavorful burgers and fries. I came to learn that the kid-friendly establishment serves a Sunday brunch with Nutella whipped cream on waffles covered in root beer syrup. It was like they cracked open my head and stole my fantasies. Burger Review : A wonderful and flavorful burger was enjoyed at BareBurger. Go there and go there soon. I hope that BareBurger finds its way to Los Angeles. I'm an advocate of dipping sauces for burgers. So it's good to know Bareburger makes use of them. No matter what cut or combination of beef is used, when it comes to taste, ground beef can use all the help it can get. Sauces expand a cook's pallete of creativity. Where's the wrong in that? The mere 10% fat is worrisome. I suspect the flavor is coming from the secret seasoning, the sauces, and the Colby-Jack cheddar. I can think of no other reason you'd apply the term "savory" to an otherwise mundane sirloin-chuck mix. The barely toasted bun is concerning as well. Perhaps they're worried toasting screws up the ozone layer. From your photo, I like that the tomato was cut very thin so as to offer just a hint of tomato presence. The onions and lettuce seem to be conservatively portioned as well. Nice review. It read more like a 4 rating than a 5 however. The extra seasoning and sauces must have edged over the line. This was a case of the whole being greater than the sum of its parts. Much like Super Duper Burger in San Francisco. A simple, but well-seasoned and thoughtfully prepared, burger can best its overwrought and over-thought counterparts. The Chuck provided the beef; the Sirloin kicked in the mineral notes; the cheese provided the fat; the seasonings gave it kick; the bun rounded out the mouth feel with a glutenous binder. Ordinarily, I prefer a well-toasted bun, but the sear provided the firmness required to deliver a well-rounded bite. I loved this burger. I am considering blowing off a fresh review just to go back and savor this one again. BareBurger doesn't grind all the meats themselves, and therefore has no control over what you're really eating, or how clean or dirty the grinding machines are, or how good or bad the pieces of meat that go into the grinder are. This is very hard to swallow, but true. I think making burgers in an iron pan at home cannot be beat, and I know the quality of the meat I'm using all the time. I hate it when a great burger slips.I am sorry that you had a poor experience there, Adam. The name "Bareburger" comes from the fact that they charge $12 for a burger bare of dressings, bare of side order, and bare of flavor. I ordered jalapenos on the side, which they remembered to charge me for but not to include. Four burgers, two fries $60. And two napkins in the bag. I can't bare anymore of this place. Went here with my family for a fun night out. Four of us ordered shakes with our burgers. Burgers came out pretty fast. Shakes came out more than 10 minutes later. Wtf, am I supposed to not drink something with my food? My burger was basically done by the time the shake arrived. Burgers were ok, shakes were a problem, totally not worth about 30 per person for 5 people. The taste of the burger was very bad to my taste, I wonder if they've had to pass any meat inspection tests.